No other breed is more of a ‘gentle giant’ than the Newfoundland dog. 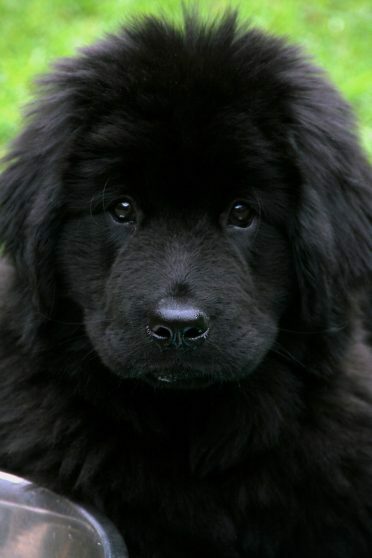 Also called Newfies or Newfs, Newfoundlands are one of the most beloved breeds today. It’s easy to see why these big, fluffy dogs are so popular. Aside from a cuddly appearance, the Newfoundland has a friendly yet courageous nature. Plus, Newfies have natural protective instincts that make them one of the best family dogs today. Let me tell you everything you need to know about the Newfie. Where did the Newfoundland come from? What was the Newfoundland dog bred for? What does a Newfoundland look like? Is that a Newfoundland or a Landseer? Are Newfoundlands good with babies? Can Newfoundlands be left alone? What are the ideal living conditions for a Newfoundland? How much exercise does a Newfoundland need? How much does a Newfoundland eat? What health issues should I expect with a Newfoundland? How long is a Newfoundland dog pregnant? When is the right time to neuter a Newfoundland? How much does a Newfoundland cost? As you might have guessed, Newfoundlands trace their origins to the Dominion of Newfoundland (now the Canadian province of Newfoundland and Labrador). The breed is descended from another Canadian-bred dog, the St. John’s dog, which is incidentally also called the lesser Newfoundland. Newfs are closely related to other Canadian dog breeds, including the Golden Retriever, the Labrador, and the Nova Scotia Duck Tolling Retriever. The Newfoundland’s lineage also includes Mastiffs, so it has a massive head, thick neck, and strong bones of Molosser-type dogs. Newfoundlands were originally bred to be working dogs for Canadian fishermen. 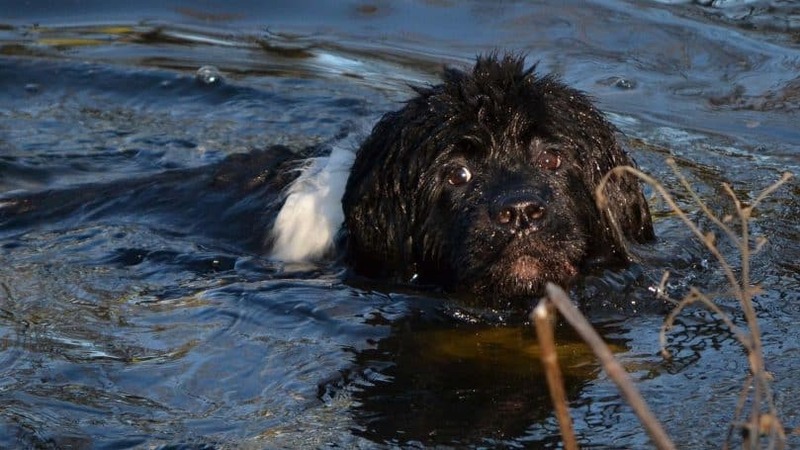 Newfies have always excelled at water rescues because of their natural swimming abilities and muscular build. Along with well-known canine swimmers like the Portuguese Water Dog and the Labrador Retriever, Newfs have a water-resistant coat and webbed feet. Newfies have the lung capacity needed to go the distance in the water and can swim more quickly through the breaststroke. Plus, a Newfie’s size makes it strong enough to support drowning men and pull them to shore. When not saving men from watery graves, Newfoundlands helped haul fish nets to shore and cart the day’s catch to the market. Newfie dogs have always been renowned because of their bravery, whether in rescues or adventuring. During World War II, the breed was widely used by various armed forces to haul supplies and ammunition. Gander, the mascot of the Royal Rifles of Canada during World War II, went above and beyond the call of duty by carrying a grenade away from wounded soldiers. Killed in action, Gander has a memorial statue in Newfoundland today. Another Newf also has the honor of being the only animal to complete the Lewis and Clark Expedition. Named Seaman, the dog belonged to Captain Meriwether Lewis and helped protect the expedition from wild animals. Sir John Franklin also took a Newf, Neptune, with him on one of his Arctic expeditions. Newfies are so beloved that these dogs are depicted in many stories, paintings, and sculptures. The poet Lord Byron loved his Newf Boatswain so much that he wrote ‘Epitaph to a Dog’ and had a monument erected in Boatswain’s honor when it died. The English painter and sculptor Sir Edwin Henry Landseer also immortalized the breed through his paintings, which celebrated Newfoundlands as water rescue dogs. These paintings became so popular that Newfies with black and white coats are now known as Landseer Newfoundlands. Given their popularity, it’s hard not to recognize a Newfie on sight. As a giant breed, the Newf is strikingly large with a muscular, powerful build. Newfies have the large heads typical of Molosser-type dogs, with a soft, soulful expression, and droopy lips and jowls. The Newf’s back and legs are strong and muscular, with massive webbed paws that ease movement in the water. Newfs also have a thick, fluffy double-coat, with a coarse, moderately long outer coat and a soft, dense undercoat. Natural oils in the Newf’s coat enhance its water resistance. 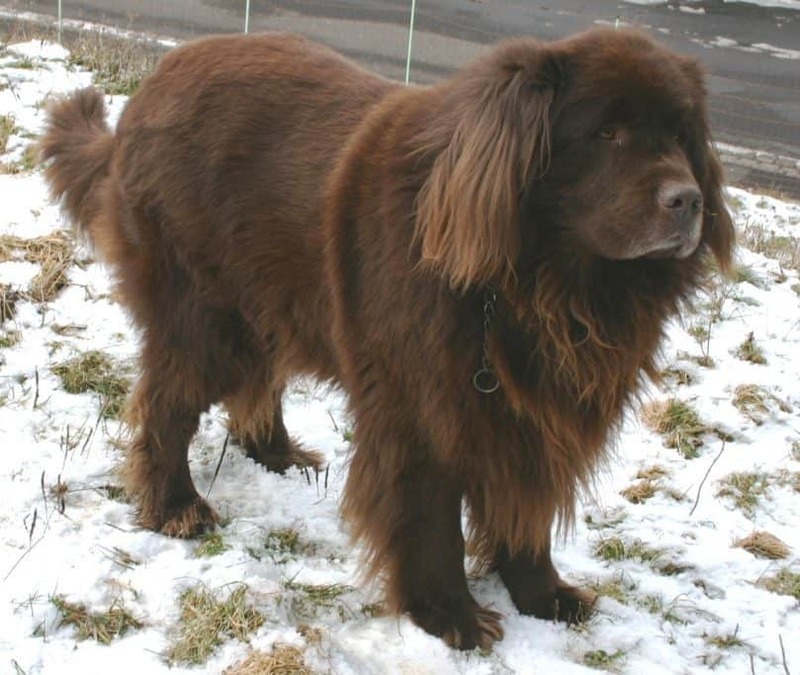 Newfie dogs can have coats in black, brown, gray, or black and white. As we’ve said before, black Newfoundlands with white markings are often referred to as Landseer Newfoundland dogs. The answer mostly depends on where you are. In the USA and Great Britain, the Landseer and the Newfoundland belong to the same breed. In certain parts of Europe, the Landseer is a distinct breed from the Newfie, recognized by the World Canine Organization as the European Continental Type (ECT) Landseer. The ECT Landseer, which also has a black and white coat, is slightly smaller than Newfies and has longer legs. If there’s one thing that the Newfoundland is known for, it’s a sweet temperament. The AKC recognizes the Newf’s gentle nature as the breed’s single most important characteristic. Newfoundlands are friendly, outgoing, and affectionate. You’ll find that your Newfie will love to lean on you and even sit on your feet, seemingly unaware of their size. Most Newfs will also be polite to strangers and other animals. Newfoundlands are known for their loyalty, displaying great protective instincts when it comes to their families. These dogs rarely bark to alert you of intruders, but they won’t hesitate to put themselves in the line of danger for their owners. Since they’re bred to be working dogs, Newfies will be happiest when doing a task or when engaged in an activity with a purpose. Give your Newf simple tasks like fetching the mail or carrying the laundry to keep him busy and happy. Newfies have such a sweet disposition that they’re gentle enough to be around babies and toddlers. These dogs have a natural affinity for kids, and its protective nature makes the Newfoundland a great nanny dog. However, that’s not to say that you should leave your baby unattended with a Newfie. With its size and strength, a Newfoundland can easily knock down a child by accident. For most Newfies, daily human contact is essential. This means the clingy Newf is prone to separation anxiety and should not be left alone for extended periods. The bad news is that the Newfoundland may express his anxiety through chewing. You can probably imagine the damage an unhappy, bored Newf can do with the size of its jaws. Unless you want to get home to a destroyed couch, remember to leave your Newfie with his favorite toys and treats before you step out the door. With their calm temperament and patient nature, Newfies are rarely aggressive without reason. However, this breed will use its size and weight to protect its family when needed, making it a great guard dog. Biting is not the Newf’s preferred defense; in fact, the Newfoundland dog’s bite force is not as strong compared to other dog breeds of its size. Rather than attack a person, a Newfoundland is more likely to put its body between its family and the threat. The Newfie is a large dog, so it will need a lot of space to move around and be comfortable. A Newf is not the ideal pet for smaller homes like apartments. With their thick double coat, Newfoundlands are built to tough out the cold weather of their Canadian homeland. The Newf will thrive in low temperatures and have a low heat tolerance, so they won’t be too happy in tropical climates. For his safety, your Newfie should also be kept out of the heat during the summer months. Of course, Newfs will also be happiest in a home that is near the water since they love to swim. Newfies are easy to train because of their eagerness to please and trusting nature. Newfoundlands are also intelligent, ranking 35th out of 100 dog breeds tested through obedience trials by the AKC and the Canadian Kennel Club. The breed responds best to gentle guidance, so it’s best to use positive reinforcement. Praise your Newfie and give him treats when he shows good behavior instead of punishing him when he misbehaves. If you want to use your Newf for water-related jobs, introduce your Newfoundland puppy to the water by the age of 4 months. This way, he can get used to the act of entering the water and swimming itself and learn commands while in the water. Leash training is also crucial for Newfoundlands. Given a Newf’s strength, it’s highly likely that you won’t be able to restrain your dog if he decides to forge ahead of you during a walk. 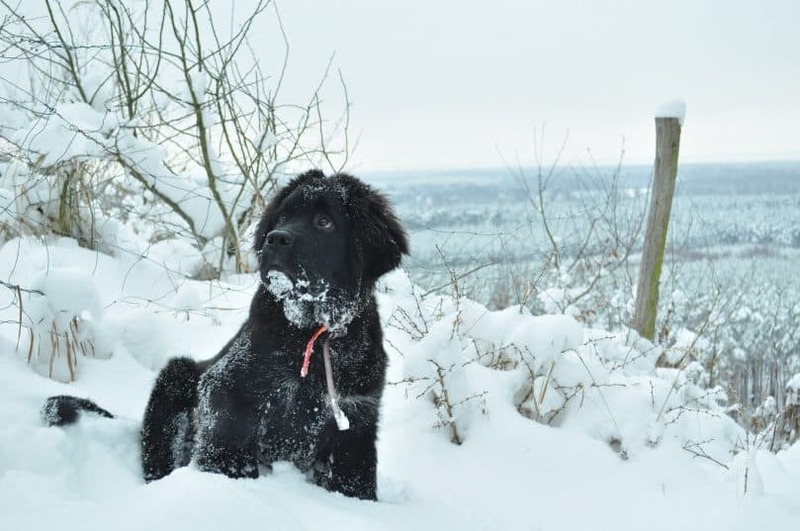 Remember to use an adjustable collar or harness when getting your Newfie puppy used to wearing a leash. Because of their strength and trainability, Newfies make for excellent therapy dogs. Newfoundlands are bred for more than just work and companionship, too. Many breeders and kennels prize Newfs for their ability to excel in dog shows, particularly in conformation and obedience. The breed also competes in agility, dock jumping, flyball, and herding. The most recent ‘best in show’ Newfie is Josh, who won in the working group and bested over 2,600 other entries at the Westminster Dog Show in 2004. Newfs and dog shows share a long history. Newfies have been participating in shows since at least the 1960s, with kennels like the renowned Nashau-Auke Kennels entering the dogs in obedience and leading them to championships. The Nashau-Auke Kennels were started by Jane and Ronald Thibault whose first Newfoundland was named Cindy. Once Cindy earned her Companion Degree, the Thibaults decided that they wanted to breed Newfoundlands, producing homebred Newfies from show-winning sires and dams all over the country. The kennel’s first Newfoundland champion was Dauntless, who won at a Farmington dog show in 1968. Most Nashau-Auke Newfies are accomplished when it comes to water rescue work and drafting, having been trained extensively by Jane and Ronald. Many Newfies from the kennel have earned titles as Water Rescue Dogs, placements in Versatility, and degrees in conformation and obedience. Several Nashau-Auke Newfoundlands also achieved the Register of Merit, having produced a number of champion offspring. By 1973, the Nashau-Auke Kennels had produced 21 champion Newfoundlands, with 18 of these dogs being homebred Newfs. For their efforts in breeding best-in-class dogs and their service to Newfoundland owners, the Thibaults received the Gaines Medal for Good Sportsmanship from the Newfoundland Club of America in 1985. Despite their excellence at water rescues and affinity for adventuring, the Newf is not a highly active dog. Newfies need only at least 30 minutes of moderate exercise daily. They’re always up for a swim, no matter what the weather is. 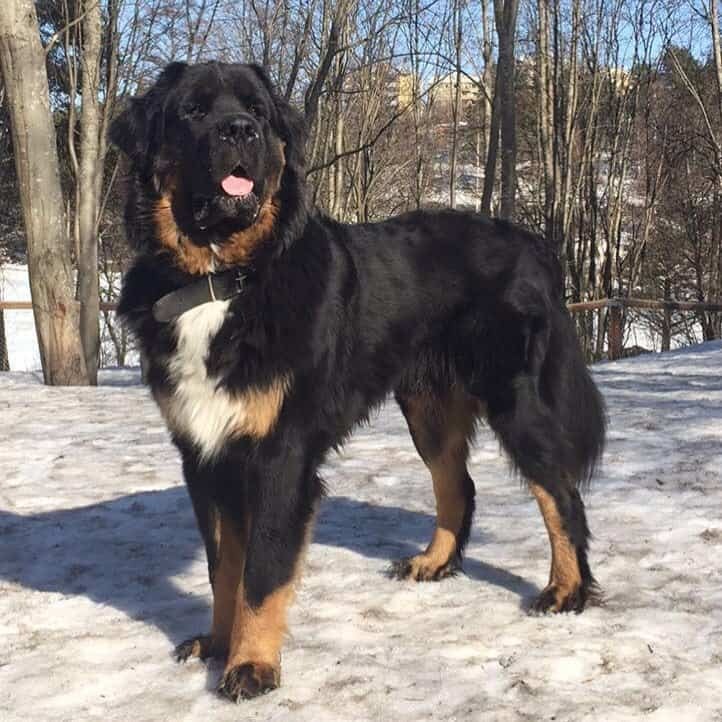 Newfs will love frolicking in the outdoors, and your Newfoundland will love walking and hiking by your side. They’ll even help carry your gear. Your large Newfie will also serve as a great guard dog on camping trips. Most Newfoundlands aren’t built for running, as the exercise is hard on their joints and may aggravate orthopedic problems. 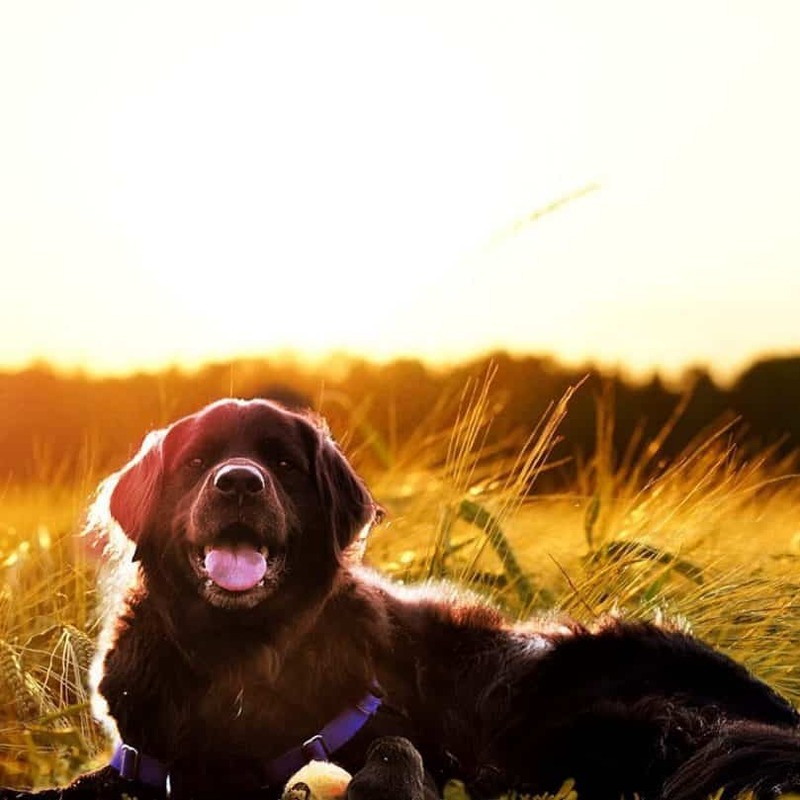 You’ll also want to keep your Newfoundland puppy from strenuous activities like jogging or jumping until he reaches full physical maturity at the age of 2. Hard exercise can damage your Newfie puppy’s growth plates, which take 2 years to form fully. Taking care of a Newfie can be a challenging task, especially given the dog’s size. Expect moderate shedding from a Newf, but the shedding gets worse during spring and fall, when a Newfoundland’s new undercoat grows in. Prepare for your arms to get tired from daily brushing sessions during shedding seasons. In the winter and summer, you can dial it down by brushing your Newf’s heavy coat at least once a week. Going over the Newfie’s coat with a slicker brush and a long-toothed comb keeps the fur tangle-free and removes dead hair. With the amount of fur they shed, Newfies are not hypoallergenic dogs. You’ll want to invest in a vacuum cleaner to keep your home free of fur and dander that can trigger allergic reactions. Your Newfie has thick fur on its outer coat, and it’s a good idea to keep your dog looking neat by keeping its fur at a medium length. Trimming your Newfie will also help prevent infections, particularly in the ears and paws. With some patience and a set of basic grooming tools, you can give your Newf a trim at home. Start by trimming the hair on your Newfoundland’s chest and back. Use a grooming rake to lift the hair in the direction of its growth and cut the hair at a uniform length. Work your way from front to back on your Newfie’s body. Cut away the feathered hair growing on your dog’s front and behind, particularly on the legs. Don’t forget the legs to trim overlong fur in your Newf’s elbow pits. Comb out and carefully cut the excess fur from around your dog’s feet and between its toes. Comb downward on the outside of your Newfoundland dog’s ears to trim hair so it’s in line with the jowls. Lift the ears and cut away overly lengthy strands of hair growing under ear canal. The hair on the top of your Newfie’s head should be trimmed to a medium length as well. The Newfie can be a magnet for dirt, especially if it’s been playing in the outdoors. Expect to spend some time removing leaves, dirt, and mud from its coat and paws. Clean your Newfie after an outdoors trip by wiping down its fur and feet with a wet cloth. Make those Newfoundland dog kisses even more enjoyable by brushing your Newf’s teeth two to three times a week. Keep its face slobber-free by using a bib for your Newfoundland. Make sure to check your Newfie’s ears for redness or bad odor at least once a week. Wipe the Newfoundland’s outer ears once a week with a gentle ear cleanser from the vet. Unless you’re raising a show dog, Newfies need to be bathed only every month or two. Frequent bathing only strips the Newf’s coat of its natural oils, causing irritation and skin allergies in your dog. Giving your Newfie a bath is a fairly simple process. Dilute the dog shampoo in water before you put it on your Newf’s coat; you make the task easier by putting the shampoo-and-water solution in a bottle that you can squeeze over your dog’s coat. Use warm water to soak your dog’s fur and work in sections, making sure to massage the shampoo solution into your dog’s coat. Your Newfie’s coat should be soaked and soapy to the skin. Don’t forget to give your Newfoundland’s head and the bottom of his paws a good lather, too. You can never spend too much time rinsing your Newfie. Spray your dog with water and rinse out every bit of shampoo; make sure no suds appear when you squeeze a section of his fur. Newfies have the appetite to match their size. These dogs need 4 to 5 cups of high-quality dry dog food each day. Divide this amount of food into two meals each day to reduce the risk of bloat and other digestive problems. The best dog food for the Newfoundland contains a moderate amount of protein. Dog food for extra-large breeds is ideal, as this food includes just enough protein to strengthen your Newfie’s bones without causing weight gain. Avoid feeding your Newf dog more than the recommended amount. It’s better to keep the Newfoundland lean to prevent aggravating bone and joint problems. The Newfoundland has a life expectancy of 9 to 10 years, but some Newfies have reached the ripe old age of 15. Unfortunately, no matter how well you take care of your Newf, he may suffer from a wide variety of health issues. On the simpler side of the spectrum of health problems for the Newfoundland are ear infections and sensitivity to heat. On the more serious end of the spectrum for Newfoundland health issues are genetic diseases like subaortic stenosis, cardiomyopathy, and cystinuria. Your Newf is at a greater risk of hip and elbow dysplasia because of its size. These large dogs are also predisposed to the degeneration and rupture of ligaments in the knee, a condition called cranial cruciate ligament rupture. Like the Saint Bernard and the Great Dane, Newfies are prone to bone cancer or osteosarcoma. A Newfoundland with bone cancer may be subjected to radiation and chemotherapy, but surgical amputation is the standard course of treatment. For Newfoundlands, cancer rates in proportion to mortality are at 16.8 percent. Have a pregnant Newfie at home? You can expect your dog’s pregnancy to last for 58 to 63 days or roughly 9 weeks. 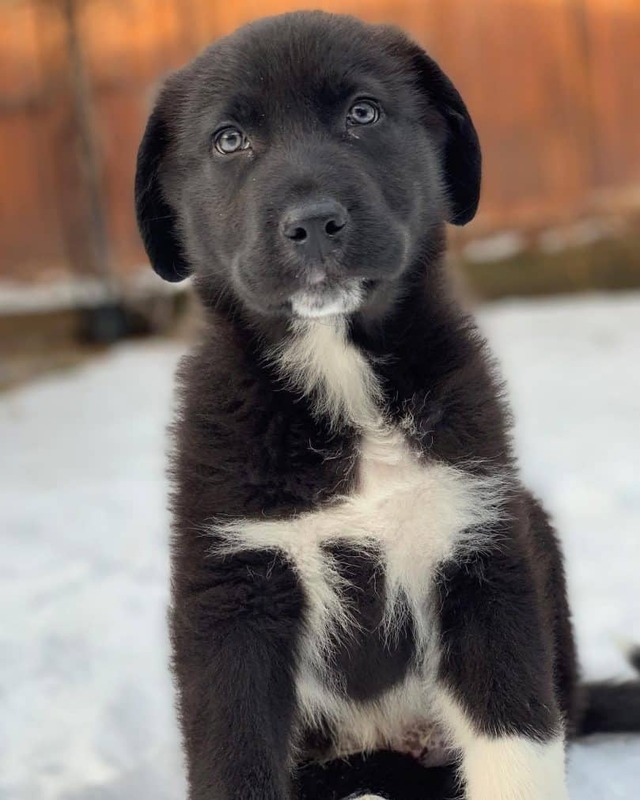 A Newfoundland’s litter size tends to be average at around 4 to 12 puppies, so be prepared to have your hands full with adorable little Newfs that look like bear cubs. If you’re not going to use your Newfie for breeding purposes, it’s best to have it spayed or neutered. Male Newfoundlands can be neutered anytime after they reach puberty at 6 to 7 months of age. Once your male Newf starts to lift his leg to urinate or to mount, it’s safe to have his testicles surgically removed. It’s a little trickier to determine when a female Newfoundland should be spayed. A female Newfie can’t be spayed during its season, when it goes into heat, which occurs twice a year and lasts about three weeks. Many breeders and veterinarians recommend spaying a Newfie before she goes into her first heat cycle. Studies have shown that spaying female Newfs before their first heat cycle can significantly reduce the risk of mammary cancer. Neutered Newfies are also less prone to aggression and less likely to roam and be injured in search of a mate. Of course, having your Newfie’s ovaries, uterus, or testicles removed also eliminates the risk of infections or cancer developing in these organs. Given their popularity, Newfies often cost a pretty penny. A reputable breeder may charge anywhere from $1000 to $2000 for each Newfoundland puppy. The costs often depend on the puppy’s gender, pedigree, and origin. If you’re looking to buy a Newfie puppy, your priority should be finding a reliable breeder. The right breeder will have raised Newfoundland puppies at home or in an environment where they’re exposed to various people, sights, and sounds. This helps with the puppy’s early socialization. If you want to adopt an adult Newfoundland, your best best is to talk to rescue organizations for the breed. The sad news is that many Newfs end up in rescues or shelters because their former owners could not afford to raise them. Newfies are considered as one of the most expensive dog breed to own, with the prices of grooming and healthcare adding up to pretty hefty yearly living cost for the Newfoundland. 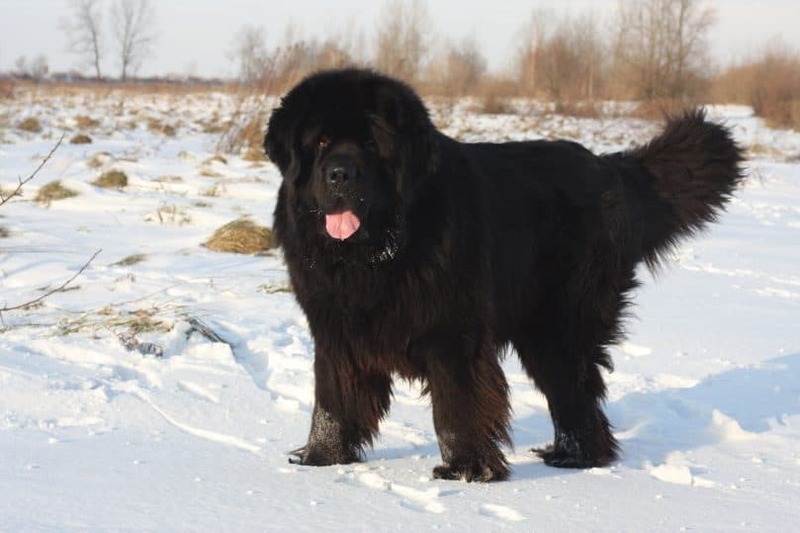 The Newf is already lovable as a purebred dog, but these Newfoundland cross breeds will definitely win you over. Also called the Newfypoo, the Newfoundland-Poodle mix offers both the intelligence and energy levels of the Poodle and the patient, sweet disposition of the Newfie. The Newfoundland Lab mix is incredibly hardworking, affectionate, and loyal, thanks to the similar temperaments of its parent breeds. If you’re looking for an extra-large, extra-sweet dog to cuddle, check out the Saint Bernewfie, the cross between two of the biggest dog breeds today. 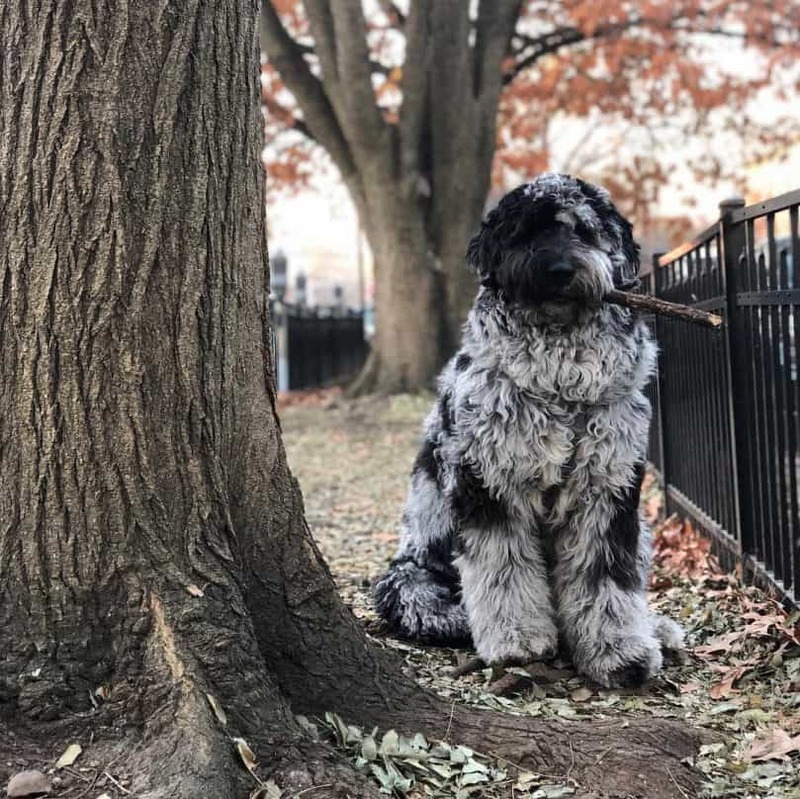 Another large crossbreed of the Newfoundland, the Newfoundland and Great Pyrenees mix have a strong guarding instinct thanks to their Pyrenean heritage. With its sweet temperament and affectionate nature, the Newfoundland is one of the best dogs you can get for your family today. Newfies are an intelligent breed, proven by their track record at dog shows. You won’t have problems getting these dogs to do tasks and teaching them positive behavior. 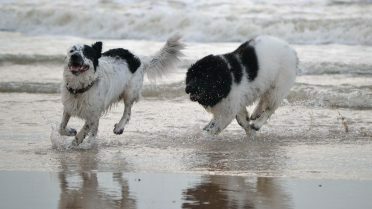 However, Newfs are also prone to a long list of genetic and orthopedic conditions, which makes them expensive to raise. Plus, the Newfoundland’s size and double coat make grooming a bit of a chore. Don’t forget to leave a comment if you think a Newfoundland dog is worth the challenges!